Winston A. 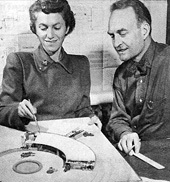 ("Win") and Elizabeth ("Lisl") Close (n. Scheu) were an influential husband-and-wife team of modern architects in the midwest United States. They practiced from the 1930s to the 1980s, mostly in and around the Twin Cities of Minneapolis and St. Paul, Minnesota. This web site is a small collection of items documenting their career, with an emphasis on their residential work. It is maintained by Win and Lisl's grandson, Winston W. Close. This 2006 booklet by Colin Kloecker and Tom Trow was the inspiration for, and remains the nucleus of, this web site. September, 2002 Issue of Sparks, the Minnesota AIA newsletter, detailing Lisl Close's award of the Minnesota AIA Gold Medal for lifetime achievement.